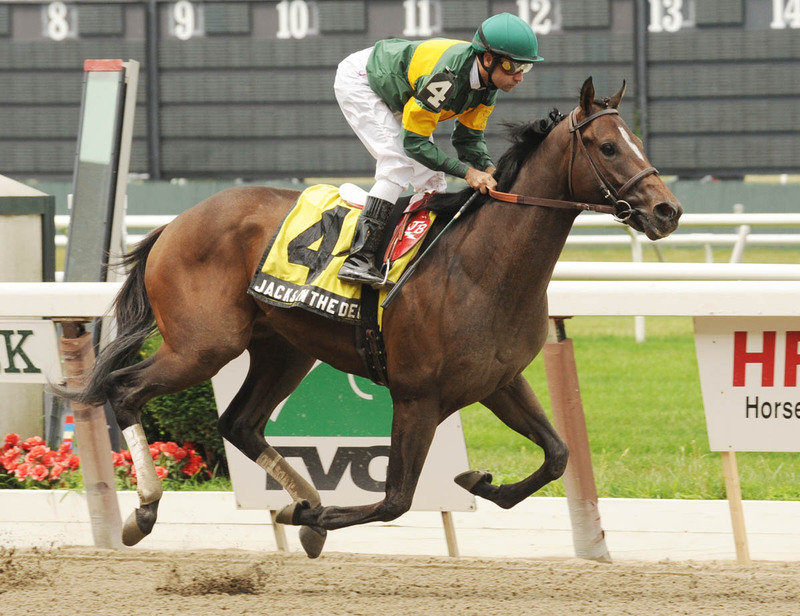 Nothing like having your horse break his maiden in a prestigious grade 2 at Belmont. That’s exactly what Skeedattle Stable’s Jack’s In The Deck did Sunday against a short field of 5 other juveniles. Second favorite Team Six set the early lead but began to sputter into the stretch. It appeared favored Tarpy’s Goal (CTD NP) was poised to make a move toward the front but he began to veer towards the stands. That parted the seas for Jack’s In The Deck to split horses and hit the wire 4 lengths ahead. Jack’s In The Deck is a son of Love of Money, a grade 2 winner at 1 1/8 miles. The unraced dam is by Partner’s Hero who was best sprinting. For more info on his breeding you can read the TrueNicks article here. While the breeding is modest and his stretch-out potential questionable, we’ll make him a CTD NP based on his big performance. Taking advantage of a hot pace, Exfactor and Calvin Borel were able to begin the Bashford Manor Stakes in the back of the pack and slowly pick off the 6 challengers to win the first graded race for 2-year-olds. Showing quick speed in his debut win, it was somewhat of a surprising tactic to hold him back Saturday, but it paid off and could pay off in spades further down the road. He’ll head to Saratoga for a still to be determined race. Quotes from trainer Bernie Flint were exuberant which is understandable, but confidence in the Breeders Cup Juvenile at this stage seems a little hasty. The local newspaper even put “Derby 2012” in the headline, which doing so in July is especially premature. Perhaps I need to see a head-on view, but it appears Sum Of The Parts was about to get going down the stretch just before Exfactor and Calvin Borel came into his lane. Neither the chart or articles mention any interference, but I’m inclined to give Sum Of The Parts another chance in his next one. From the same team that brought us Uncle Mo (Pletcher/Velazquez/Repole), we now have a 2-year-old maiden breaker with the first triple digit Beyer speed figure of the year. The blistering final time was less than three quarters of a second off the track record-- and Overdriven was merely flashed the whip. Breaking awkward from the start he eventually came up to track behind J C’s Pride in the backstretch. After the final turn he was encouraged by jockey John Velazquez to overtake the pacesetter and finish clear by 3 ½ lengths. It should be noted, while J C’s Pride finished a well beaten 2nd, he was still 13 lengths ahead of the others and wound up with a high debut Beyer of 89. Pletcher stated he was impressed with Overdriven's performance and will point to the Hopeful (G1) at Saratoga with either the Sanford (G2) or just training in between. A $350,000 yearling purchase, Overdriven is a half-brother to Smooth Air who was a multiple grade 2 winner and Kentucky Derby entry. His big scores came in distances from 7 furlongs to 1 1/8 miles, and along the Derby Trail he won the Hutcheson and finished 2nd in the Florida Derby. Overdriven’s sire is the successful Tale Of The Cat, whose runners have excelled at multiple distances and surfaces. Note: The Pletcher/Velazquez/Repole tandem also had another impressive maiden winner in the 4th race that day by the name of Zow. Hogy was able to stay undefeated by winning his second try at Arlington Park Saturday. He allowed a speed duel to ensue up front and professionally bided his time before kicking into gear down the lane. With the first 2-year-old stakes at Arlington still 3 months away, you have to believe his connections will move him to another circuit in the near future. Hogy is the son of Offlee Wild, who was a fixture on the Derby Trail in 2003 by winning the Holy Bull and finishing 3rd in the Bluegrass before ending up 12th in the Kentucky Derby. His most notable win would come 2 years later in the grade 1 Suburban at the Derby distance of 1 1/4 miles. Hogy’s damsire Petionville also tried out on the Derby Trail with a win in the Louisiana Derby before lackluster performances in the Illinois Derby and Santa Anita Derby. He would later win the Ohio Derby at 1 1/8 miles. Algorithms CTD NP, another Pletcher trainee, has been taken out of the training due to a left hock injury. He is penciled in to return to training around August (DRF). Top winning BRIS figs last week: Overdriven-111; Hogy-101; I'll Have Another-97; Zow & Broadway King-95; She Digs Me-95; Making Amends-92. Winning Beyers last week: Overdriven-100; Hogy-85; I'll Have Another-83; Zow-73; Broadway King-82; She Digs Me-74; Making Amends-76.